The UN Secretary-General on Friday expressed his grave concern for thousands of civilians caught up in an escalation of fighting across southwestern Syria, close to the border with Jordan. “The Secretary-General is also concerned at the significant risks these offensives pose to regional security”, the statement continued. According to news reports, Syrian government forces went on the offensive against opposition held territory on Friday in the region, which is of major strategic concern, close to the border of both Jordan and Israel, where tensions over the Golan Heights provoked clashes between Israeli defence forces and Syrian troops just a few weeks ago. “Recalling the de-escalation and ceasefire arrangements that have provided relative calm in southwestern Syria over the past year, the Secretary-General urges all to exercise restraint and uphold these commitments as a matter of priority,” the statement concluded. 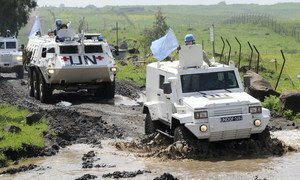 The United Nations chief has called for an immediate halt to all hostile acts and provocative actions to “avoid a new conflagration” in the Middle East, following reported exchanges of artillery fire over the Golan Heights.